J'adore Plus More: Walk the Runway...Comfortably! Who has been lucky enough to go on holiday recently? What footwear carried you from your front door, to the airport, through baggage security and passport control, until you're finally seated and belted in safely, and that plane is surging down the runway? Now that we are back in the full swing of things, I have had some time to sit back and observe life around me. 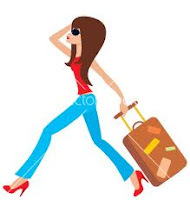 As you know, I work in the travel industry, and in the last two and a half years, I have seen countless women struggle in very cute, but fierce (fierce on those poor toes and the ball of the feet!) shoes. I have seen women whose outrageous heels have seen them resort to baby steps, meanwhile check-in is closing, and their train is ready to leave the platform. I have even seen women trip over on the concourse because their shoes just flat-out refuses to carry them anymore. My point is, travelling is a great opportunity to look great (and there will be a post on this soon!) after all, you have a holiday to look forward to, you can forget the about all those bills for at least 2 weeks, and you will be topping up that tan! (If you need one). However, please do make sure you are comfortable ladies. It can be laborious, and you're usually very tired by the time you get to your destination. Happy Travelling! ON THE RUNWAY ..I THINK FLAT SHOES ARE MAKE COMFORTABLE TO US IN WALK...WE CAN COMPLETE SO MANY MILES IN TH FLAT SHOES ON RUNWAY..! !